Gearbox has fficially announced the release date for the next DLC- Sir Hammerlock's Big Game Hunt- January 15, 2013. This has been noted on many sites, I saw it on the Gaige, Mister Torgue and now Sir Hammerlock's ECHOcasts on Twitter. There are also phone ringtones featuring Hammerlock quotes (in addition to Torgue and Claptrap ones) available on the official Borderlands 2 site. With some game play videos already out we can now see it takes place in a swampy area called Aegrus. Sir Hammerlock has invited you out for a good old gentlemanly hunting trip, but along the way Professor Nakayama interferes and would really like you to become his arch nemesis. 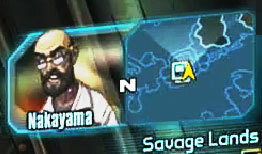 This "Hyperion Scourge" apparently poisoned the Atlus CEO and is pissed that you haven't heard of him before. He essentially pesters you into action by constantly ECHOing you while you're on the hunt. He went and crashed his ship here and locked himself out of it. Nakayama thinks Handsome Jack was the coolest person ever and has plans to clone him to restart his reign on Pandora. And maybe he can become as cool as Jack in the process. So far, I'm liking the DLC. I see the Drifters are back, saw new enemies (various Savages, Boroks and Scaylions), an awesome new vehicle (Fan boats) with 3 weapon types, and a couple new raid bosses- Voracidous the Stalker Seraph Guardian and Dexidous the Drifter. One thing in particular I liked is the Witch Doctors. They can heal or level up their allies as well a firing off varied attacks such as slag, fire and a crippling attack that dramatically slows your movement. While there still is no raise in level cap I am sure many people will complain, but I personally will complete the DLC and work on boosting my Badass Rank in the mean time. Considering I have 3 level 50's(Zer0, Maya, Axton), a 33(Salvador), and a 25 (Gaige), it'll give me a bit more time to get the lower level Gunzerker and Mechromancer up to 50.